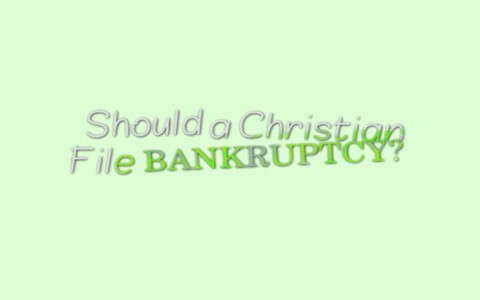 Is it biblical to file for bankruptcy? Would that be sin? What principles can we learn from the Bible about this? We are stewards of what God’s entrusted to us in this life, down to the very last penny we have. He will hold us accountable for what we did with what He gave us but also for what we didn’t do with our earthly possessions. It is so easy to have possessions only for them to have you (and me!). In the Parable of the Talents, Jesus is the man going on a journey (Matt 25:14) but before he left, he gave a certain number of talents to each one of his servants and actually “entrusted to them his property” and “To one he gave five talents, to another two, to another one, to each according to his ability. Then he went away” (Matt 25:14b-15). This is not talking about a person’s talent or ability but money or possessions as Talent in the Greek (“talanton”) means a sum of money and it could be a sum of money weighing a talent, but either way the man going on a journey (Jesus) entrusts us with “his property” which are the one, two, and five talents. Don’t miss that point; Jesus has entrusted us with “his property.” Two of the men invested the man’s property (talents) but one did nothing with it and in fact, buried it to hide it from the world (Matt 25:25). Read Jesus’ stern rebuke of the one who did nothing with his talent: “you ought to have invested my money with the bankers, and at my coming I should have received what was my own with interest. So take the talent from him and give it to him who has the ten talents. For to everyone who has will more be given, and he will have an abundance. But from the one who has not, even what he has will be taken away” (Matt 25:27-30). The point is we are accountable for what we’ve been given for it’s not really ours in the first place because it’s “his property.” Isn’t it easier to think about giving away “his property” (talents) to help others than to think it’s your money? Bankruptcy was hardly ever heard about until the 19th and 20th century. Before there were credit cards we had a few bankruptcies but after credit cards came into existence, bankruptcies exploded. I had a friend, who before he became a Christian, carried around a large credit card debt and his solution was to put it on two or three other credit cards he had. IF those got full, he’d get a new one but that’s like bailing water out of a boat by throwing it to the other end. Doing this only made it worse for my friend and finally, he had to file for bankruptcy but instead, he just walked away from it all. I never saw him again until years later when I found him living in a government subsidized home and all he had were food stamps but his church helped him with a few other necessities that food stamps don’t cover. That meant that he had been saved. He had lost it all but he had gained everything; his own soul and eternal life. Is filing for bankruptcy a sin? The Bible doesn’t specifically point out this by name as sin but there were probably sins that led up to it. Perhaps it was “covetousness, which is idolatry” (Col 3:5) which caused a person to want what was not needed. The person filing for bankruptcy could be the victim of some very bad circumstances or uniformed decisions. All sin is an affront to a holy God. For the child of God, any sin can be confessed and bring cleansing (1 John 1:9) and not one of us will ever be free from sin in this life (1 John 1:8, 10). If the person is at fault for having filed for bankruptcy, it is certainly forgivable, just like any other sin. No one can ever out-sin the work of Calvary. No sin is greater than the Savior. We can’t judge everyone who files for bankruptcy as being a result of their sins. We’re all sinners, yet saved. God alone knows the heart (1 Sam 16:7). Sometimes a person has no choice but to file for bankruptcy. I hope you’ve never had to file for bankruptcy or are facing the threat of one right now, but a couple of people I know who went through it came out of it better people. They survived it. The world kept turning. For those who simply had to file for bankruptcy, perhaps the greatest anguish for them was mental. They felt like a failure but God uses all things to work together for the good of those who love God (Rom 8:28). Is that you? If not, click on “Jesus, Do You Know Him” link at the top of our homepage. Next post: What Does The Bible Say About Adventure?